Kinley MacGregor (aka Sherrilyn Kenyon) knows danger. She lives with her husband, three boys and a collection of swords. Aside from her work as wife and mother, she is also global phenomenon and author of several popular series. Her books often appear at the top of bestseller lists. 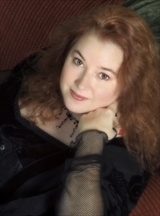 Her paranormal novel was the first to make an international bestseller lists. Her first paranormal novel was published in 1992, making her one of the genre’s longest-writing authors. Her interests include collecting manga and Final Fantasy IV figurines and sculptures, watching bad sci-fi movies, and attempting to keep up with her boys.